People with their minds set on You, You keep completely whole, steady on their feet, because they keep at it and don’t quit (Isaiah 26:3, The Message). It was a typical Tuesday evening at our house, meaning that although I was exhausted from a long day at work, hungry mouths were chirping, “What’s for dinner?” Sigh. As I slung the meat into a pan, my thoughts began racing, and let’s just say it wasn’t pretty: Not only was the pity party alive and well, but those heart palpitations were also back as I mentally juggled Wednesday’s schedule. Then, as my family inhaled the spaghetti and abandoned a kitchen full of dirty dishes, the tears came. Once again, life’s day-to-day chaos had disrupted my dreams, depleted my energy, and discouraged my faith. Why do Christian women with great intentions become overwhelmed? During times like these, where is the fruit of the Spirit—you know, those heaping doses of joy and peace that even dirty dishes can’t quench? For me, the root was undoubtedly the neglect of my Heavenly Father. Oh, I listened to Christian music. And heard Sunday’s sermons. I also prayed daily, quickly begging for strength and patience. But regular, anticipatory, one-on-one intimacy? During those days, hardly ever. Who had time? The shift for me—and by shift, I mean fresh perspective, new purpose and authentic passion—developed gradually but noticeably as I tried something new: Waking a little earlier each morning to meet with God. I wasn’t sure what to do, exactly, with all those minutes of silence. At first, there was a devotional book and fairly routine prayer. Then one morning I got creative and hummed some praise songs, just thinking about the words. Another day the urge struck to write God a love letter. There were no hard-fast rules, other than He and I had a standing appointment that was quickly becoming meaningful. Second, those pity parties at meal time morphed into prayers like, “Father, you’ve blessed me with food that fills my fridge, and I’m grateful for healthy mouths to devour this meal. Thank you for dishwashers and microwaves and spaghetti sauce in a jar.” Third, my meetings with Him began to run long. Yep, the woman who barely had time to shower was now sitting and enjoying His presence. Ten years later, as I reflect on the beginning of a consistent, intimate relationship with God, my eyes fill with tears—this time, happy ones. Oh, how He has taught me to rest, to simplify, and to listen! And those prior feelings of crippling overload? Sometimes they still tug, but the thoughts now have no lasting power. You see, each morning a sweet, two-way conversation with my Father adjusts my perspective, replenishes my energy, and puts a new song in my heart. Help me see that circumstance is unrelated to the joy and peace you promise. Strengthen my continuing, growing relationship with you. Show me that knowing you makes all the difference, not only in my thoughts, but also in the lives of those around me. More than anything, I want to know you, enjoy you, and thrive in your abundant plan for me. AVA STURGEN taught high school English before retiring in 2009 to work with teen girls. Since the release of A Daughter’s Worth in 2006, she has written for various publications and spoken at faith-based events. Her second book, A Daughter’s Heart, is set for release in 2011. To read her blog for teen girls, visit http://worthydaughters.wordpress.com/. To contact Ava directly, visit http://www.avasturgeon.com/. What do high school girls, modern-day problems, and the Bible have in common? Everything, as A Daughter's Worth reveals in this interactive, practical Bible study for teenagers. Ava H. Sturgeon, a longtime teacher, understands the unique challenges that young ladies face and gently guides them to Biblical truth through personal examples, humor, and journaling. This twelve-week study is ideal for church discipleship programs but could easily fit into private school curriculums or individual quiet times. 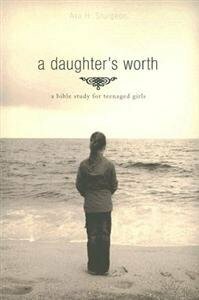 For every girl seeking value in today's world, A Daughter's Worth is required reading! Buy a copy today through Amazon or CBD! Question of the Day: When was the last time you needed a "mental makeover" because you were having a pity party? Wow. mental makeover? or brain transplant. When I think "I have the mind of Christ" I start to worry, because He certainly can't be this scatter-brained! Nothing I wanted more this new year than to find myself enjoying long moments with the Lord just as you described Ava. Thank you for the encouragement and example. I haven't had a pity-party as much as a disappointment party. When am I going to get this right? Gina,My family would starve to death or eat each other if I didn't feed them, because they can't open cans. But dogs and cats are like that, of course...I'm not sure which one would succumb to the other at this point. They're evenly matched in size. Welcome, Ava! Thanks for the thought-provoking post and for allowing us to share your book with our readers. Oh, Deb, I had a pity-party not too long ago. Maybe two weeks ago. And it was over something stupid that got me all in a funk. Why me? Why now? I'm so tired of it all. I've found when I get so self-pitifying, I have to take my focus off me. First, praise God for everything, good and bad. Second, focus on helping someone else. What would my family eat? They'd go for soups first since those are easiest. Then maybe a fried egg sandwich. Ava, this is a wonderful post! It took me years to get to the place where daily time in the Word and prayer actually take place DAILY. I can't say I've conquered all the pity parties yet, nor have I arrived at a fully transformed mind, but I know without that time I would have run screaming from this houseful of teenage boys by now! Question #1: I need a mental makeover every Sunday when I sit in our church surrounded by empty chairs and wonder why God called us here. Question #2: The last time I left them alone, they ended up eating Ramen noodles with hamburger mixed in. Ew. Who sings that new Christian pop song about needing a brain wash? Rest, simplify, listen. I think that says it all. Usually when I get into a tizzy, I'm off somewhere in one of those areas. Sometimes it's harder than others to get back, but with time I do make it there. In fact, last night I was feeling a little overwhelmed, and as my Inky sisters already know, I deleted about half my emails unread. Felt great to simplify. Oh, and for the record, husbands and children are capable of washing dishes too. Just sayin'. Ava, it has taken me years to get to the point that you're talking about. And I must admit, I wish I'd learned these lessons when my daughters were younger. I do think that God can and will use me to help my daughters reach this point and to help the middle school girls I work with. How hard it is to learn to slow down enough to listen and how life changing it truly is. Thank you for obeying God and working with our young women. My daughter has certainly grown in her Christian walk because she 's been one of those lucky enough to be in your Bible studies. Blessings on you and yours. God is making his voice loud and clear to me this year. And he keeps using posts here to help do it. My assignment is to work on developing the mind of Christ in my life. Thanks, for hanging with us around the inkwell, Ava. Great post, Ava. I needed it, as I am currently in pity-party-land right now. I saw myself in your post. I need to work on my spiritual makeover, to rely on God and seek Him for what I'm supposed to be doing instead of piling all of this junk on myself. My husband is great at finding stuff in the back of the freezer that needs to get used up and cooking in general. (I'm the one who wants to pick up fish tacos on crazy nights.) The kids are capable of making sandwiches, too, so they'd all live. My day goes so much better when I spend time with the Lord. Food? Sam just made waffles from the Good House Keeping cook book. Bacon. Eggs. Gotta love the snow day!